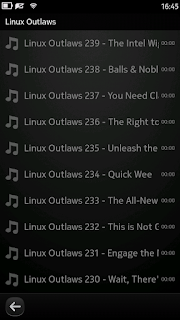 On the first screenshot, you can see the Harmattan QML UI of gPodder 3.0.1 showing the Linux Outlaws episode list. As you can see, about half of the screen is "wasted" with information that is global across all episodes. On the second screenshot, you can see the development version of gPodder, showing the exact same screen, but this time with common prefix elimination enabled. Right now, we have a very conservative algorithm for detecting common prefixes (i.e. it has to be a real common prefix across all episodes) - one could think about improving this with some heuristics, e.g. removing the podcast title in front of episodes, calculating the common prefix of a certain majority of episodes, etc. - I'm interested to see how the user base likes this feature, and if there are situations where this does more harm than good.